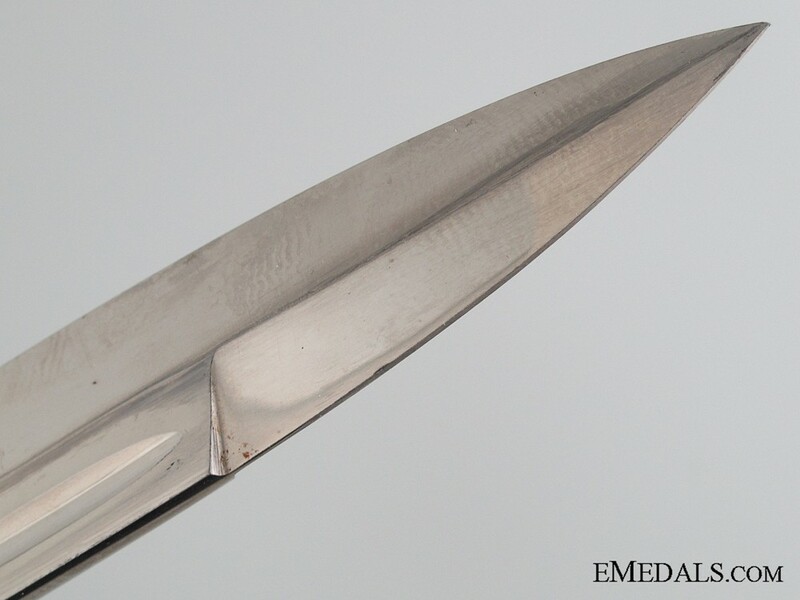 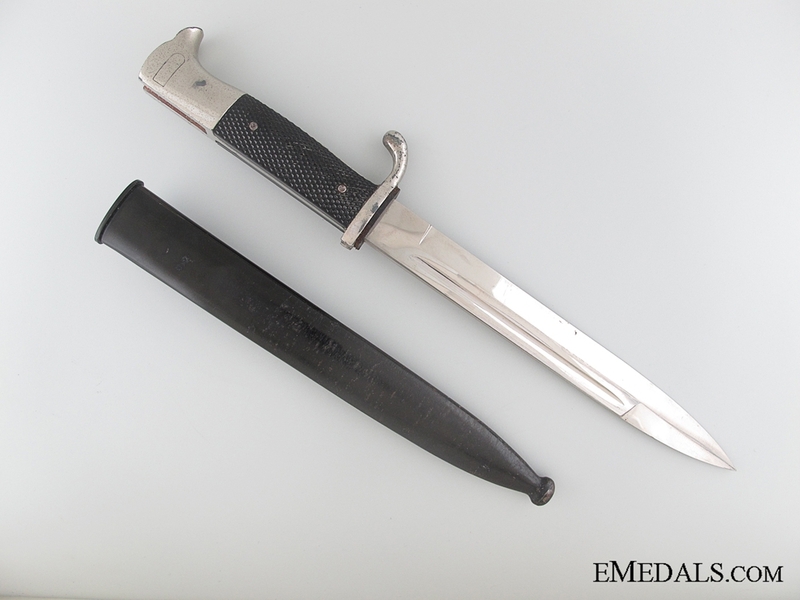 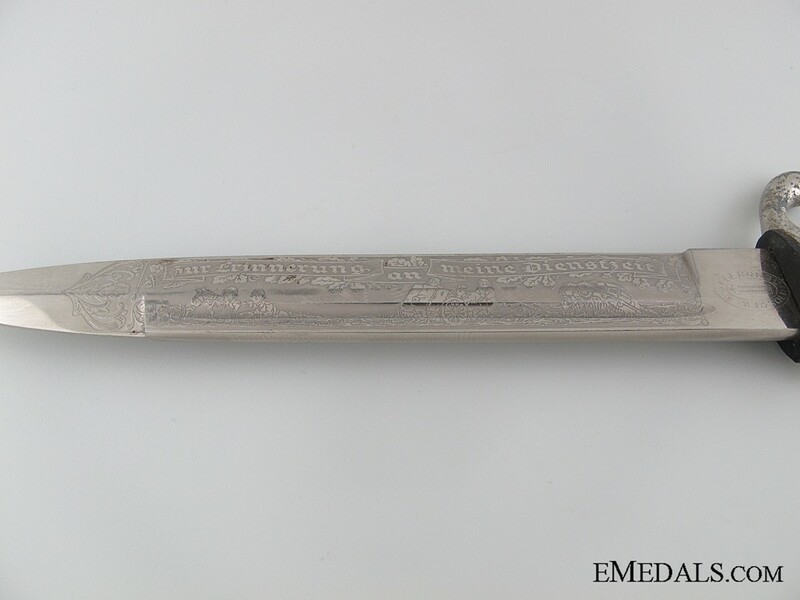 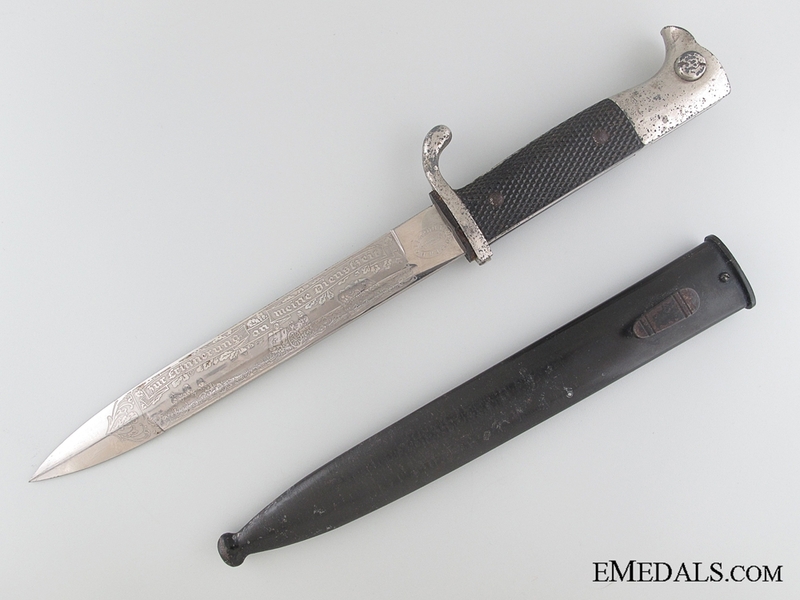 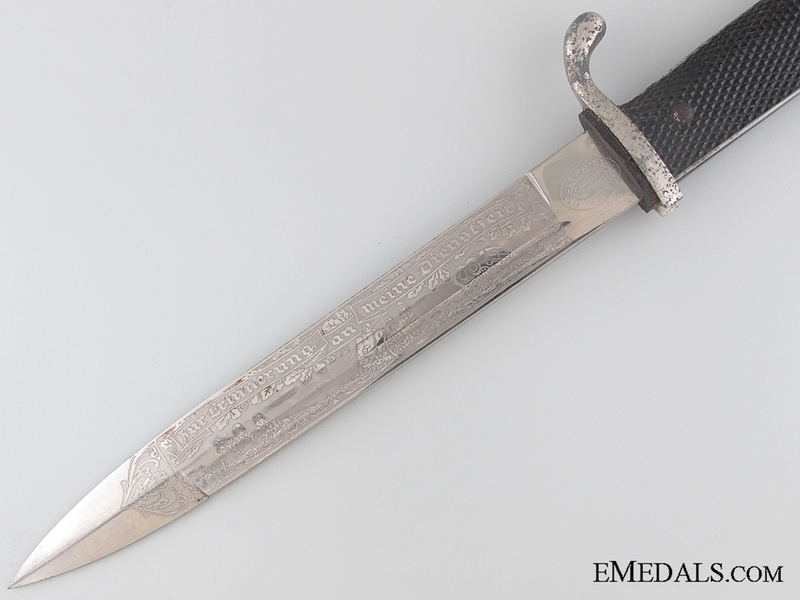 Army Etched Short Bayonet by F.W. 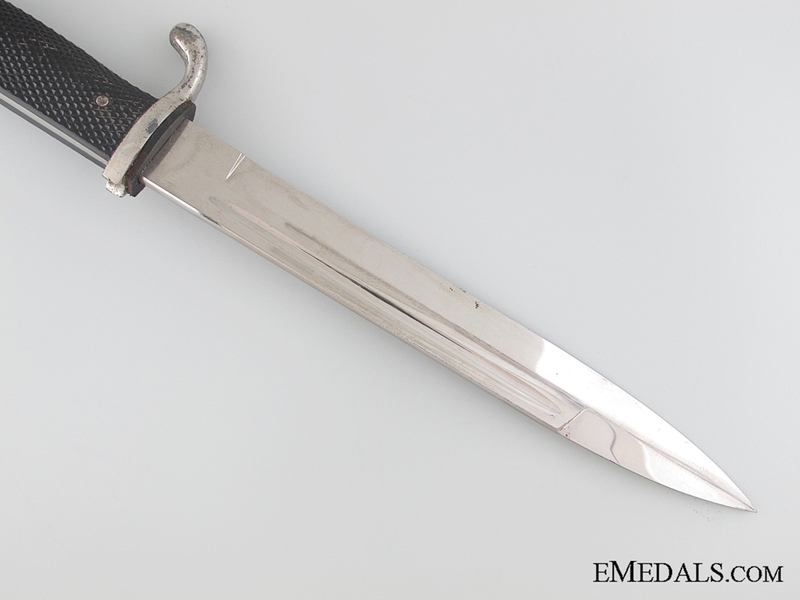 Holler - Measuring 350 mm, with the scabbard on, this dagger features a 198 mm nickel-plated steel blade, with an extremely sharp edge, remaining bright and crisp, and having a very sharp tip. 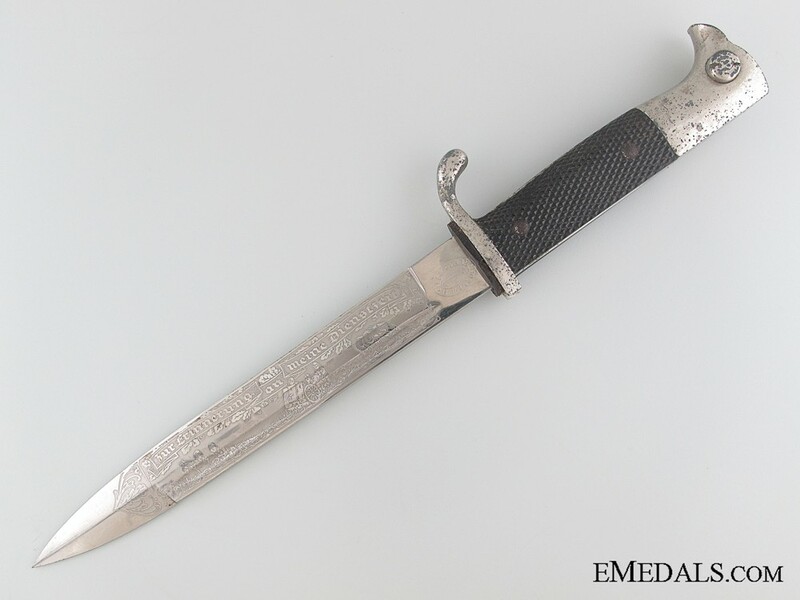 It is etched with a ribbon banner inscribed "Zur Erinnerung an meine Dienstzeit" (In Memory of my Service Period) and graphics of machine gunners, artillerymen and a tank, flanked by oak leaves on the blade on one side, with fullers on both sides. 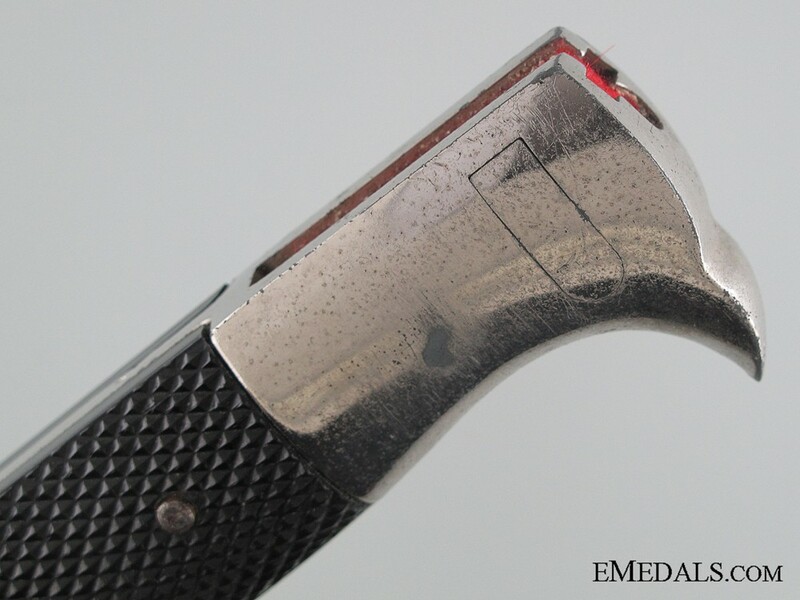 The blade's ricasso is maker marked F.W. 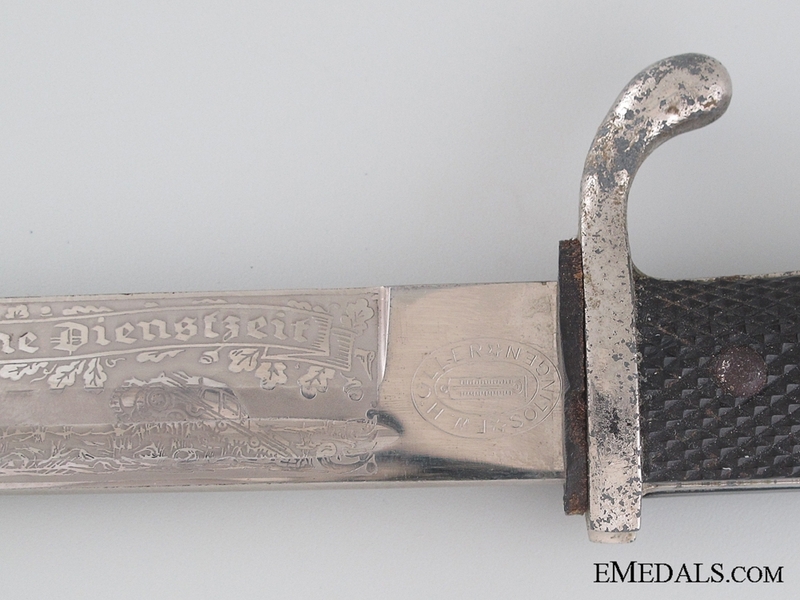 Holler Solingen, with the company's thermometer inside an oval insignia. 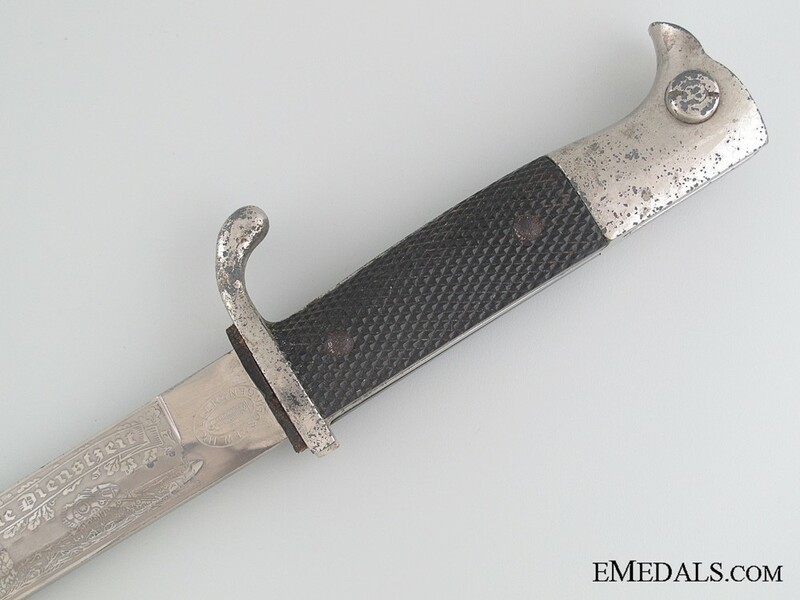 It retains its crossgraining, with light wear and exhibits scratching overall, common to extraction and return to the scabbard, and a natural shine, very fine. 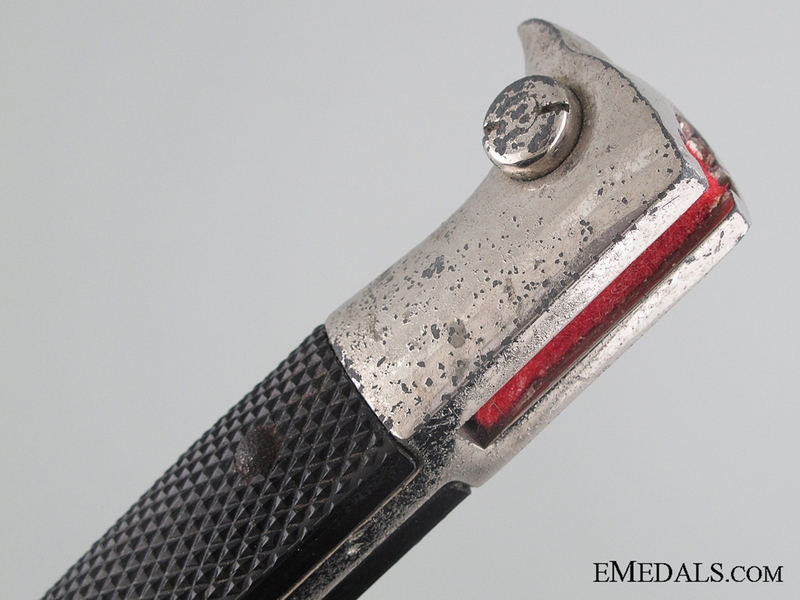 Black leather washer remains very supple and intact. 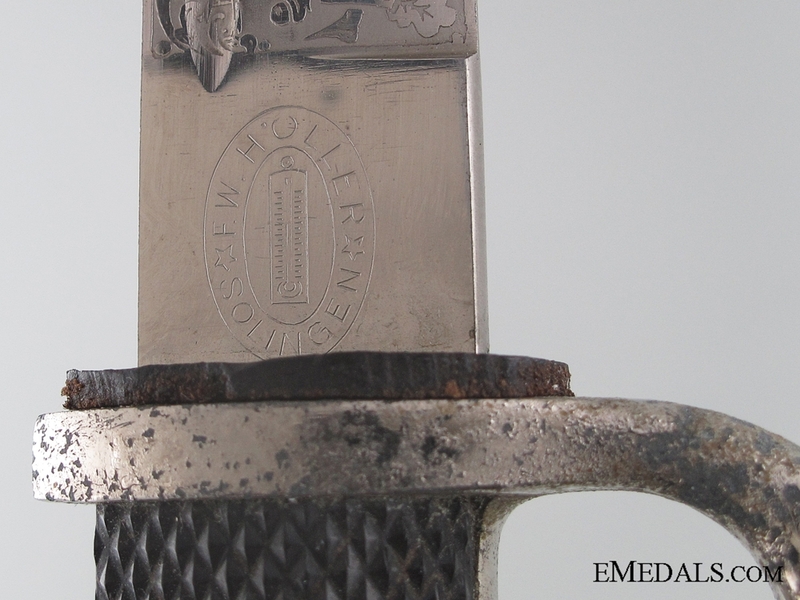 Crossguard with quillon and pommel exhibits gilt bubbling and wear, while both plates of the black synthetic grip are firmly held in place by two rivets and central pins. 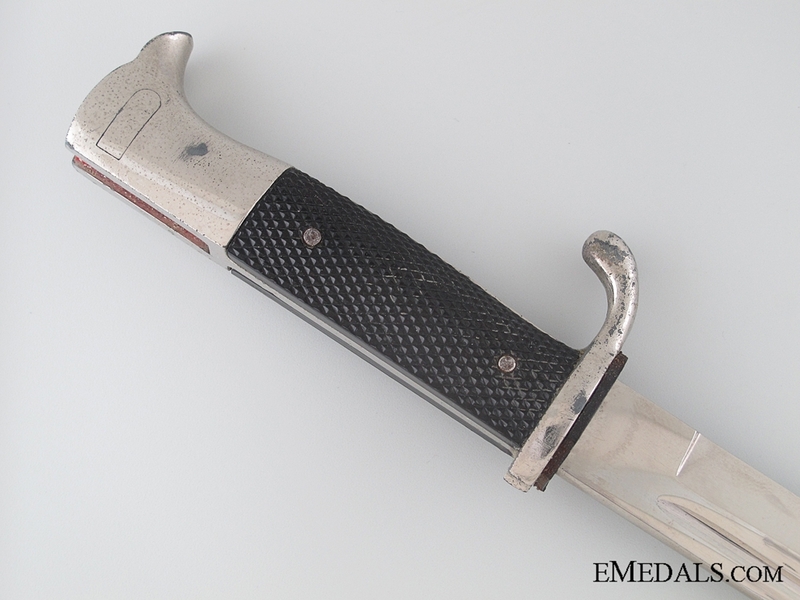 Accompanied by its black metal scabbard, magnetic, with frog stud, metal locket at the blade entry end, ball finial, measuring 30 mm x 227 mm, black painted exterior exhibits scuffing and crazing, near very fine.